After I finally resolved the installation of PB Jelly on Emu (running Ubuntu 16.04), I’ve had a PB Jelly assembly running for the past two weeks! I’ve gotten tired of checking on its status (i.e. is it still running?) every day, so I dove in and figured out how to set up Emu to email me when the job is complete! To get this going, I mainly followed this msmtp ArchWiki guide., but here are the specifics of how I set it up. This is a configuration to allow emails to get sent via the Univ. of Washington email servers. Yes, I currently had UW password saved in this file, but will be addressing this issue below. This command pipers the output of echo to sudo and uses tee -a to append to our desired file (/etc/mail.rc). That will send an email with no subject and the body of the email will contain “Job complete!”. That’s the basic set up for this. To use it in your workflow, you’d append that command to the end of any Bash command or in a separate Jupyter notebook cell that is queued to run after a previous cell completes it’s job. This will run the first echo command. When that finishes, then the email command will run. You can get fancy and have different emails in response to how the running program exits (i.e. fails or is successful) and send different email responses, but I’m not going to get into that. Anyway, not bad! However, we want to make this a bit nicer and more secure. Follow the instructions under the Creating an Encryption Key section at this link. DO NOT CREATE A PASSWORD! JUST HIT ENTER WHEN AT THAT STEP. Technically, this is does not follow proper security protocols, but this is better than having a plain text password, and setting it up this way is the only way the mail program will send without prompting the user for a password (which kills the automation we’re trying to achieve). After entering that, type your UW email password(NOTE: You will not receive a new prompt, so just type it in), and then Enter. Then, press Ctrl-d.
passwordeval    "gpg --quiet --for-your-eyes-only --no-tty --decrypt ~/.msmtp-password.gpg"
Feel free to change the Subject and/or From info to whatever you’d like. To use this in your workflow, you’ll do just like before (but using the command immediately above) and append to the end of any Bash command. Appending those lines is going to be difficult to remember, is annoying to type out, and displays your email address (particularly if using a publicly hosted Jupyter notebook like most of us in lab do). Here’s a nice way to remedy that. That should spit out your email address and is ready to be used! So, from now on, all you have to do is append the command emailme to the end of any Bash commands and you’ll get email when the job is finished!!! You can edit Steps 1 & 2 to use a variable other than “EMAIL” and an alias other than “emailme” – use whatever you’d like. This entry was posted in Miscellaneous and tagged email, emu, encryption, gpg, msmtp, password, ubuntu on 13 December, 2017 by kubu4. The last “fix” didn’t fix everything. 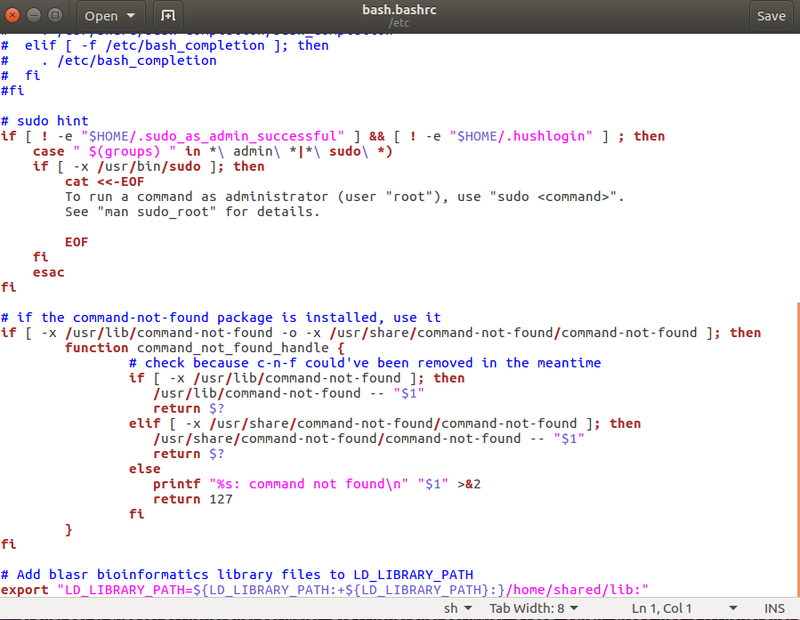 The line uses a fancy bash test to determine if the $LD_LIBRARY_PATH variable already exists. This is to prevent the $LD_LIBRARY_PATH from having a leading ":". As usual, the solution to that problem was found courtesy of StackExchange (#162891). Also, by putting this line in the /etc/bash.bashrc file, it makes the variable available for all users. This entry was posted in Miscellaneous and tagged $LD_LIBRARY_PATH, blasr, emu, PB Jelly, pbjelly, ubuntu on 30 November, 2017 by kubu4.